Thanks to Jack Lepiarz for the comparison. We’re Movin’ On Up… to the International Court of Justice in The Hague. George Jefferson isn’t really a war criminal. He’s not even a real person. 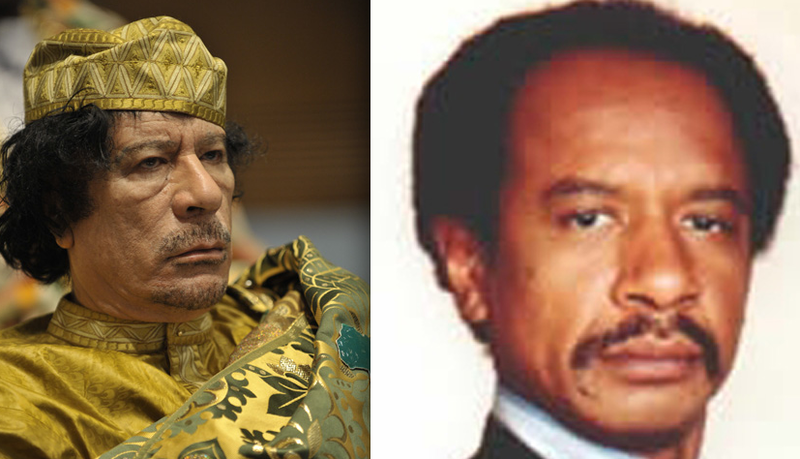 He does look an awful lot like Momar Gadhafi, whose status as a war criminal has been proven in spades over the course of the past week. As we speak, diplomats the world over are working on ways to loosen Gadhafi’s grip on power as fears mount that even greater atrocities will be committed against mounting opposition. The United States is “reaching out to opposition groups” and has frozen $30 billion in assets that Gadhafi has been using to pay African mercenaries to attack an opposition movement whose ranks now include many of his former soldiers and diplomats. Supposedly pro-Gadhafi forces are surrounding a city outside Tripoli occupied by opposition forces, waiting to launch an attack aiming to give Gadhafi some much-needed momentum. Even if they succeed, the civilian casualties such an attack would necessitate would only hasten the fall of Momar Gadhafi. Things in the Middle East have been as unpredictable as ever, but as the Andrew Bruss of andrewbruss.com, I find it hard to believe that Gadhafi will be in power come Saint Patrick’s Day. Do they celebrate Saint Patrick’s Day in Libya?